The convergence of tech and finance gets physical. Just as tech companies have geared up to offer financial assistance to users, so financial institutions are trying to capture and apply the data generated by technology. The Wallet Card has a cell phone chip and most of the working parts of a computer, including a display — all inside a piece of plastic that looks like any other credit card. The display has 65,000 pixels and a user interface that allows the card holder to change between different cards and informational screens. Dynamics has the support of a number of big banks, payment networks, and carriers. Members include Visa, MasterCard, Sprint, and JCB (a Tokyo-based credit card company). 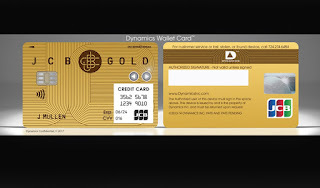 Dynamics has the support of the Wallet Card Consortium, which includes a number of big banks, payment networks, and carriers. Members include Visa, MasterCard, Sprint, and JCB (a Tokyo-based credit card company).Dynamics has raised $110 million to date from investors that include MasterCard, CIBC, Adams Capital Management, and Bain Capital Ventures. The company’s earlier intelligent account cards are currently used by more than 10 million consumers. Customers include the big Canadian coffee chain Tim Horton’s, the Upper Deck Company, and CIBC.